With Christmas round the corner, I am spending more time in the kitchen baking cookies and cakes and preparing traditional sweets. I made Gulabi Puvvulu, popularly known as Rose Cookies on Sunday and today it was Coconut Burfi. 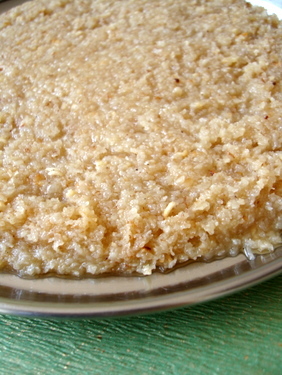 We usually make Kobbari Undalu using grated coconut and jaggery. 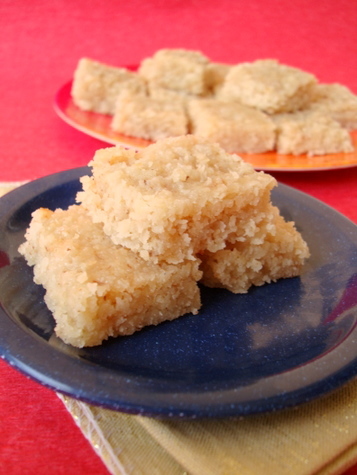 Decided on trying my hand at coconut burfi/paakam that calls for the use of sugar instead of jaggery. This is my first attempt at making Coconut Burfi and am yet to perfect it. Its all in the sugar syrup consistency. 1 Take a heavy bottomed vessel, add water and sugar and on medium low flame allow the sugar to dissolve and come to a boil. Stir it and allow the syrup to thicken. Let the sugar syrup cook and thicken till it reaches 2 string consistency. Test the syrup by using your thumb and index finger and touch the sugar syrup and as your stretch the syrup, it should form at least 2-3 threads. This takes approx 15-18 mts. 2 Immediately at this stage add the grated coconut, ghee and cardamom pwd and stir. Stir at regular intervals till the mixture appears thick and leaves the sides of the vessel. This could take about 15-18 mts. Turn off heat. 3 Immediately pour the mixture on to a greased thali (use ghee to grease) and spread out evenly with a spatula. Allow to cool and slightly harden. Cut into desired shapes and cool completely before storing in an airtight container. We are all waiting for your new recipes for the New year. Happy Holidays to you and your family Sailu! Good recipe, I made them for Diwali this year. I accidentally started looking very recently when I searched online for a recipe and became a fan of your site. I like your postings a lot. If you have a search by ingredients it would be more helpful to find recipes based on what everybody has. I have recommended your site to many of my friends. Thanks a lot for lovely recipes. I have a request, Can you do a post on Singhada nuts(they’ve a black outer covering and white meat inside) and Gengulu(they look like brown sticks). Its been ages since I have last had them or seen them. I hope you are familiar with these ingredients. Thanks Sailu for another traditional sweet. à°•à±Šà°¬à±à°¬à°°à°¿ à°¬à°°à±à°«à±€ à°šà°¾à°²à°¾ à°¬à°¾à°µà±à°‚à°¦à°¿. à°•à±Šà°¬à±à°¬à°°à°¿ à°²à±Œà°œà± à°…à°‚à°Ÿà±‡ à°‡à°¦à±‡à°¨à°¾? What a perfect look that has….. Well prepared & captured well too….. I may be sounding the same…but it is not my fault… Every prep of yours is the same too…. as usual brilliant….I have saved it for my future encounters….. & can pass it on too… to my newly wed sis in-law…. Do I need to use raw coconut or dried coconut? Thanks for the mouth watering recipe. Happy New Year. Happy New Year, Pratap garu. Use raw grated coconut for this recipe. Coconut burfi is so nice. We used to make coconut laddus with d same procedure, but kids liked to eat as burfi instead of laddus. Thank u so much. Belated Happy New Year wishes. i really enjoy your site…….keep up the good work! i tried this recipe but i did not get this nice brown colour… why ?? I should say, I became a fan of your blog. I don’t cook anything without referring to your blog. I made Fruit cake, pulav and chicken curry listed in your blog, for a christmas party at home and it was a success. i became a fan of ur site. i tried kobbari burfi. but i didn’t get brown colour. what’s the reason.tell me pls. The color depends on cooking of sugar and grated coconut. Also when you grate coconut along with the brown layer you will get a brown color. 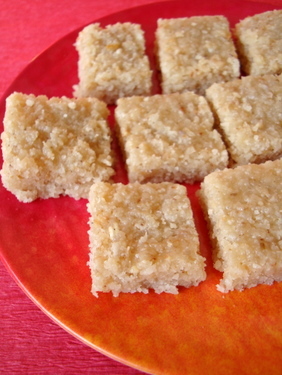 coconut burfi islooking very yummy…I have a doubt, can we use frozen coconut for this? I’ve become a fan of ur site. Daily i’ll visit ur site at least once. 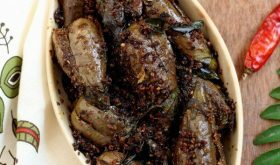 naku chalaa nachayai me recipes…. Fresh is best. But you can use finely grated frozen coconut. Is it possible to use dry coconut for this recipe? Yes, you can try with dry coconut. We tried with coconut powder, started forming lumps. When you use, dry coconut powder you need to use more water. Water ration should be double.